New Orleans has been on my travel list since I first saw Interview With a Vampire way back when I was in High School. Oh, how time passes! Anyway, when B and I were discussing what to do over our Memorial Day adult weekend, NOLA was suggested and quickly decided upon. After I gathered input from a few close friends, I planned a great weekend getaway. 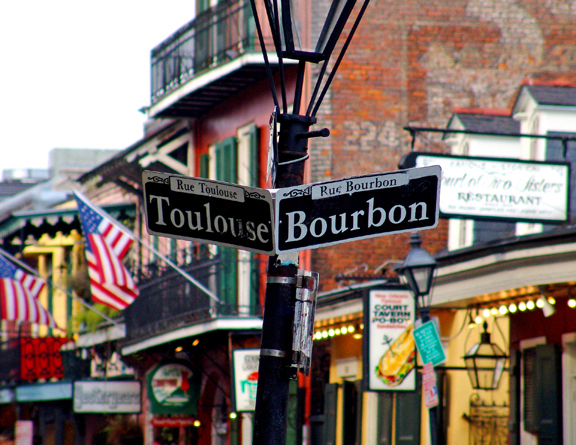 Listed below is how we spent two days getting acquainted with the Big Easy. We stayed at the Windsor Court in the French Quarter to be close to all the action. It was absolutely perfect. Now mind you, this is an old hotel so don’t expect perfection. If you’re looking for that, I’d suggest the W, one of my all-time favs in any city. We were looking for something more authentic and the Windsor Court was just what we were looking for. Day 2 found us wandering aimlessly down Royal Street, stopping and browsing in the many antique shops and art galleries. B picked up some cuff links and I my very first set of pearls. I guess I really am grown up! At Jackson Square, I had my palm read~ “I can see you losing twenty dollars in the very near future”~ and then it was off to Bourbon Street to Pat O’Briens to have a famous headache-inducing Hurricane. Can you say sugar overload?! We ended our night at Tipitinas, a very hip live music venue. Sunday morning we enjoyed a late brunch at Commander’s Palace, which I have to say is a bit overrated. We strolled down Royal Street again and managed to squeeze in a mani/pedis at the mall before our flight home. Short and sweet, it was a great introduction to a city I am looking forward to visiting again soon. I can’t believe you didn’t like CP? I think its because you are such a food connoisseur now! Did you go to the Oak Alley Plantation in Vacherie? It’s the plantation that was used for their house in Interview with the Vampire- It’s about 20 minutes away from NOLA. I didn’t! And I can’t believe I didn’t think of it! We were there less than 48 hours so there’s much more I need to see and experience to get the whole NOLA effect. I’ll definitely be back! That’s true with anywhere you go, though. You’ll always come home wishing you had done something else.